As you know, National Home Security Month has now finished and one of our ‘key’ activities during this time was raising money for Remedi UK by donating 40p for every key that we cut during October. We also had a collection jar on our trade counter for customers to contribute. We fixed the donation at 40p per key because we’re celebrating our 40th anniversary this year and because we knew that we cut hundreds of keys every month, it would soon mount up. Between the number of keys cut, donations from customers and us rounding it up to a nice round figure, the final total was £250. 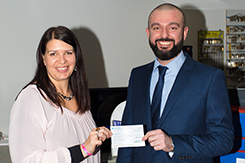 Gareth Jones, a regional manager from Remedi UK popped in this week to collect the cheque (pictured with Calder Security Marketing Manager, Sarah Ainslie). We like to support a related charity each year during National Home Security Month; last year we donated to Victim Support. We chose Remedi UK because we are interested in the idea of restorative justice as it appears to be not only really effective in helping people get over a break in but can help to rehabilitate those who perpetrate them. We also wanted to support a Yorkshire based charity this year. Steve also pledged to use the donation specifically on helping victims of burglary. National Home Security Month may well be over for another year but you can catch up with everything that we’ve done this year here and we will of course continue to offer news, advice and tips about home security all year round. If you would like advice on your home security then give us a call on 0345 833 5543 or send us a message. You can read more about what Remedi UK offers here. next Could a burglar be caught by his walk?